Hey you. Do you remember how easy it was to get your driver's license? Yeah about that... Childs play. Want to pass the Class A commercial driver's test? You may have failed before you even began. Yesterday, a buddy of mine and I asked ourselves the hard question. It may look familiar but my money says you've never seen one in real life. Hit the Link to find out what it actually is. Parking Tickets from Private Security? I was always aware that the good old boys (and girls) in blue could legally give you a parking ticket but today my wife received a ticket from a mall-cop-esq private security firm. What likes to eat time, monies, and has four wheels and a roll cage? Well Oppo, I have a dilemma and I'm hoping that the masses of educated and enlightened can help me out. Here is my situation. I got to work on parts for this one while I was at Griggs. I wish I got to see it run in person. There is a high likelihood I will be in your country in less than a year for vacation. that said I have some questions. Here is a MV Agusta for your time. This phrase has been uttered by my wife on many occasions sometimes with me driving and other times with her driving. Often times it is followed by a comment about how a vehicle is being driven poorly and without care for others. I don't have a tv much less cable but I do have "teh interwebs"! Is there any place I can watch the /drive Monaco thing? 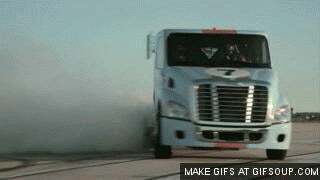 Drifting Dodge dually for your troubles. So just as I said, my wife and I took our BMW down to Santa Cruz and back and this is how it went. Just a friendly reminder of the bay area Cruise to Santa Cruz. Cruise to Santa Cruz repost for the afternoon shift. Just a friendly reminder for all who care to join. Calling all Bay Area Oppos! This saturday there is an open invite to cruise to Santa Cruz and just enjoy a day of driving and the boardwalk. Those traveling from the Sacramento area will be taking this route down. How Lincoln should be saved. Let's face the facts. In spite of success of the FoMoCo mothership, sales of the sub brand Lincoln Motor Cars have been less than good. Bad. It's been bad. If it's going to be fixed something needs to change. That change is going to have to be drastic and awe inspiring. Here is how I would do it. I had a goal, and now i'm closer than ever to it.